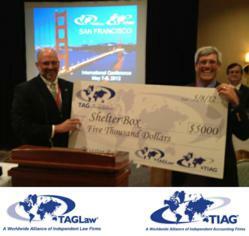 TAG Foundation, the charitable foundation of TAGLaw® and TIAG®, contributed $5,000 to the charity ShelterBox USA during the alliances' recent international conferences in San Francisco. ShelterBox provides emergency supplies to survivors of disasters around the world. Read the entire article on ShelterBoxUSA.org.